2015: Happy Birthday WHE! As we count down to our fifth year of operations we look back at some of the accomplishments of Wild Horse Education (WHE). Core to our work is the fight to gain humane treatment of wild horses and burros. Our documentation has been utilized in countless news broadcasts, stories and litigation. One of the milestones of the work of WHE. The story of Humane Care and how it grew. We were told it was impossible. We were told not to “waste time and energy” trying. We were told this by some of the most expensive legal minds in advocacy. We obviously, did not listen. In our very first year we won the first court orders against inhumane conduct ever obtained since the passage of the Wild Free Roaming Horses and Burros Act. At Triple B in 2011 our cameras covered extensive, almost daily, activities during a Bureau of Land Management (BLM) roundup. Driving back and forth across the state we also built a compelling legal argument presented in federal court. In August of 2011 a Temporary Restraining Order (TRO) was won. 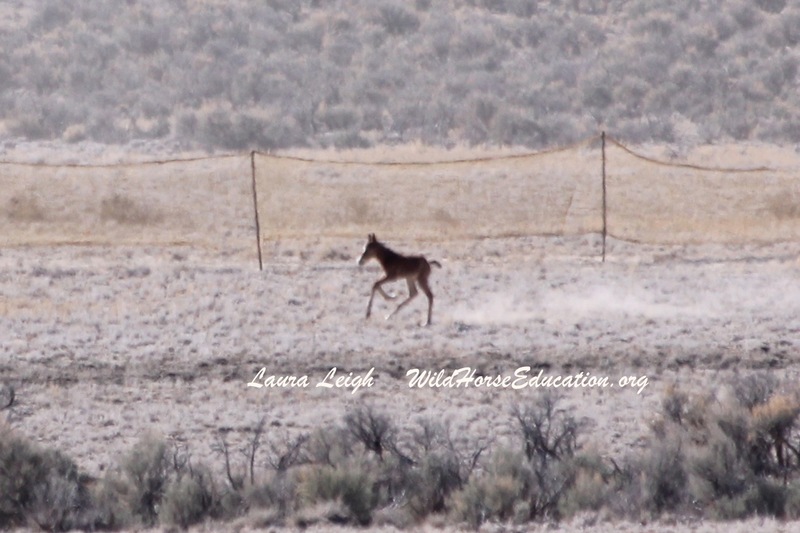 Judge Mckibben went on to recite the only declaration, of the four presented to the Court, that addressed an instance where video taken by Plaintiff Laura Leigh of Wild Horse Education (WHE) shows a BLM contract pilot coming dangerously close to a horse. Judge Mckibben could see an exhausted animal and the pilot apparently making contact. He said he did not appreciate the “blame the horse” direction of the Defendant’s statements. The case remained active in federal court on the underlying Complaint and request for Preliminary Injunction. In December of 2011 the BLM released a report on Triple B that essentially confirmed all allegations in the ongoing court action. In June of 2012 WHE amended the Triple B case to include Jackson Mountain. 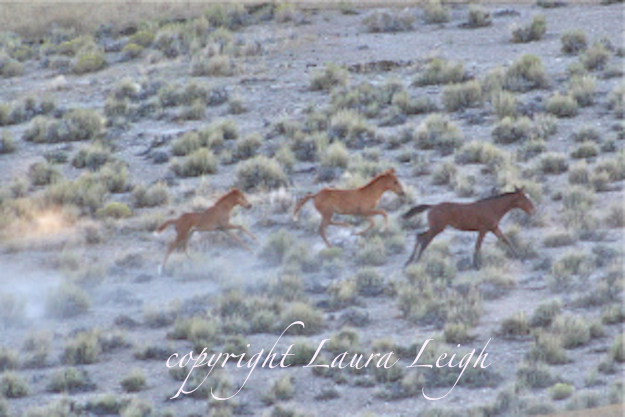 A “purported emergency” that resulted in BLM rounding up newborn foals in June as private livestock continued to graze public land. WHE won. In June of 2012 the case on inhumane treatment was granted a Preliminary Injunction. This particular win was created based on another win against violations of the First Amendment carried by Leigh and WHE that has just won sound legal building blocks in the Ninth Circuit Court. Continuing the legal battle to gain a humane care policy, in January of 2013 WHE filed against conduct and unjustified removals at the Owyhee Complex. First gaining a TRO. BLM began working on a mechanism to accept public contributions to create shade structures and windbreaks in holding in 2014. CAWP includes both the roundup and the facility. A Comprehensive Animal Welfare Policy (CAWP) is to be included in contracts beginning in 2015. As we await the finalization of the first policy in the history of the act, memorandums on protocol remain in place. WildHorseEducation.org remains devoted to gaining protections from abuse, slaughter and extinction for our wild horses and burros. 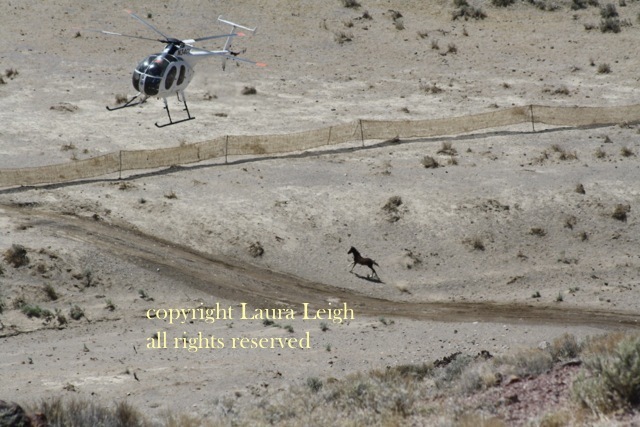 Yesterday, August 30th 2011 in a Reno Nevada Federal Courtroom the Honorable Judge Howard McKibben granted a Temporary Restraining Order against the continuation of documented helicopter pilot conduct at the Bureau of Land Management’s (BLM) Triple B wild horse roundup in Eastern Nevada. Citing his authority as a Federal Judge to enjoin an agency’s conduct where their actions have been demonstrated to be “in violation of an Act” Judge McKibben issued the TRO. 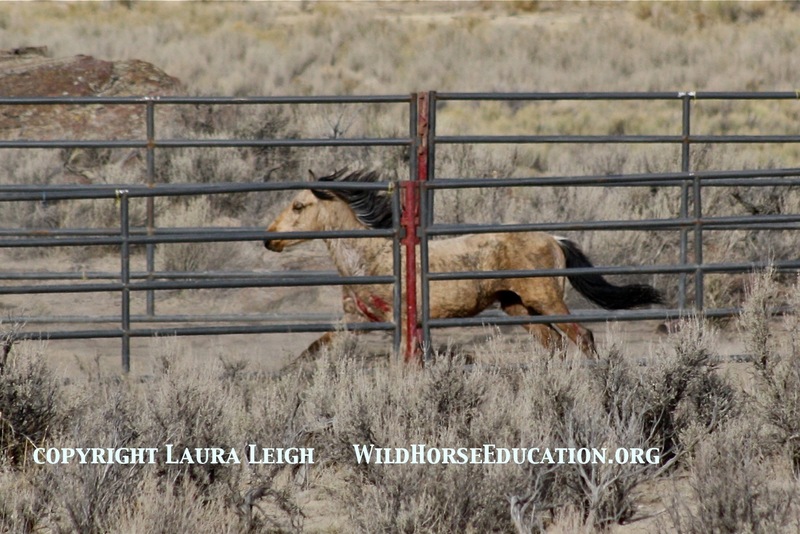 Judge Mckibben went on to recite the only declaration, of the four presented to the Court, that addressed an instance where video taken by Plaintiff Laura Leigh of Wild Horse Education (WHE) shows a BLM contract pilot coming dangerously close to an exhausted horse apparently making contact with the animal was in direct contrast to what was recorded. He stated that the declaration by Defendant was not what he observed in the video as he could see an exhausted animal and the pilot apparently making contact. He said he did not appreciate the “blame the horse” direction of the Defendant’s statements. Although McKibben did not rule in Plaintiff’s favor on other cited alleged violations he did verbally address the Defendants. For example in the insufficient water assertion McKIbben did say that if the horses drain the water they should simply be given more. An amended complaint was filed yesterday, September 8th 2011, in Federal District Court Reno, Nevada. The action was filed by attorney Gordon Cowan on behalf of Plaintiff Laura Leigh, Founder of Wild Horse Education (WHE) against the Bureau of Land Management (BLM) and the Department of Interior (DOI) asserting allegations of inhumane treatment of wild horses at roundups. The amended Complaint comes after a Temporary Restraining Order was issued to inhumane helicopter pilot conduct at the Triple B roundup in Eastern Nevada. That decision was rendered more than a week ago by Federal Judge H. McKibben. The BLM has yet to directly address the ruling. Instead the BLM simply released a report completed by the American Association of Equine Practitioners (AAEP) which claims that conduct is acceptable, but cautions helicopters to keep their distance, on the same day the Court ruled. The Triple B Complex gather was initiated on July 20 and completed on August 31, 2011. The gather was conducted by the Ely and Elko District Offices who manage the herd management areas in the complex. Sun J was the national contractor who conducted the gather. Responsible District Managers are Rosemary Thomas, Ely District and Ken Miller, Elko District. Incident commanders overseeing the gather were Mary D’Aversa, Shell Field Office Manager and Brian Fuell, Wells Field Office Manager. Contract Officer’s Technical Representatives were Ben Noyes, Ruth Thompson, Kristine Dedolph and Bruce Thompson. 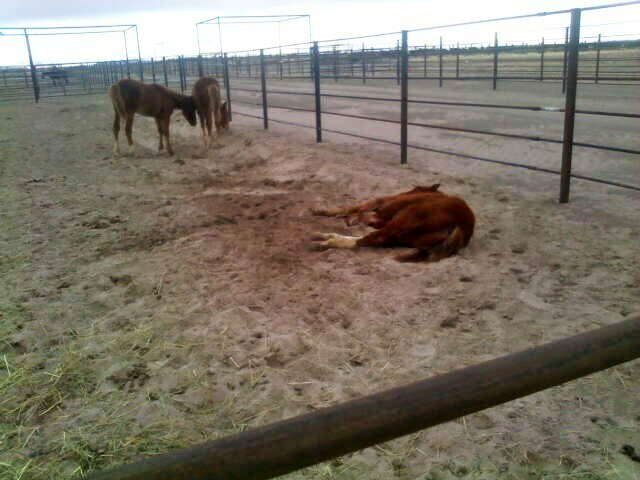 The goal of the gather was to gather and remove 1,726 wild horses. Gather results were 1,269 captured, four returned to the range, four gather related deaths and eight non-gather related deaths. In late August, Laura Leigh filed a lawsuit in Reno District Court alleging animal abuse and inhumane animal treatment among other things. 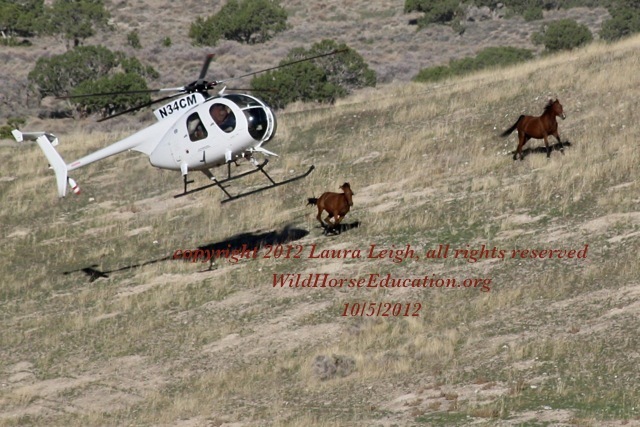 On August 31, 2011 Judge McKibben issued a temporary restraining order to prohibit the use of the helicopter as demonstrated on August 11, 2011 (Laura Leigh video), that appears to strike a horse with the skid or flying the helicopter unreasonably close to a horse during the Triple B Complex gather. Our response to the team report can be read here. In addition to simply responding in writing, we continued to document and take them to court and to the “court of public opinion.” We continued to win. Today we have a humane handling policy in it’s first year. The policy is in a “test” phase with a revision team expected to complete and file a review and amendments. Our work to tighten and refine this policy continues.